Making an "extreme" version of a familiar game doesn't always work out that well. Just ask Slamball and the XFL (which is coming back for some reason). Yet, one gym teacher has endeavored to somehow improve upon rock-paper-scissors. 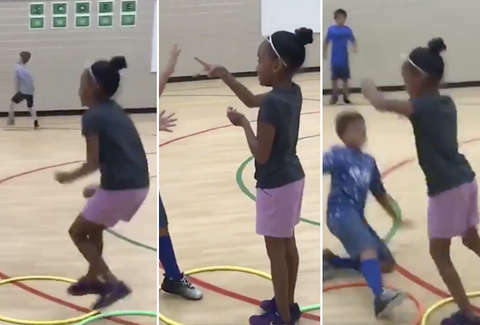 Eric Branch, a gym teacher at Indianapolis's Lowell Elementary School, posted a video of a fourth-grade class playing an intense version of the schoolyard classic. It went viral. The video on Facebook has been viewed more than 11 million times in about a week. That number doesn't even account for other views like the below share from ESPN. Branch calls the game "Hoop Hop Showdown," and it looks like his students are enamored with the game. "I love the reaction that it's gotten," Branch told Indianapolis's WISH-TV. "I think what's most powerful about it is not the game itself, but the kids and the energy that they have in the video." It appears the game is played with two teams who try to get to the other side of a hula-hoop path. When two players meet, they play rock-paper-scissors, and the winner gets to move on. It's easy to see why it has so many views. Who isn't wishing they got to play this in elementary school phy ed?